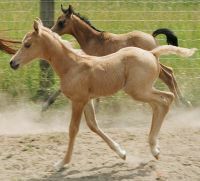 “ Shak” is a buckskin delight! Some of the best Skipper W Quarter Horse bloodlines crossed exceptionally well with the internationally known *El Shaklan/Comar Bay Beau/ Zainhoa Arabian blood. 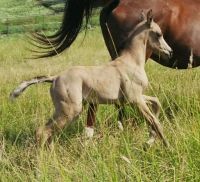 Shakl inherited his sire’s laid back shoulder, short back and substantial hip and from his Arabian dam came his nicely shaped head, well set on arched neck and long legs. 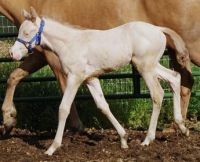 This colt’s solid Quarter Horse bone compliments the graceful movement he inherited from his dam’s floating trot. Shaklan represents the excellent quality performance horse that comes from the great cross of Arabian and Quarter Horse blood. And add Buckskin color to boot! “ Stormy” was born in the middle of a tremendous lightning storm heralding his birth. When he first opened those baby blues we were as surprised as he was! 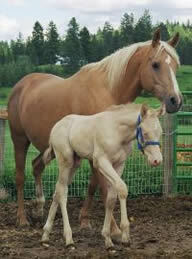 He certainly was a cremello not a palomino. 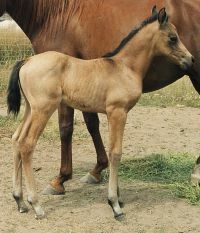 Stormy’s dished Arab head, well set neck, strong shoulder, short back and strong hip display the perfect union of the Arabian crossed on the Quarter Horse. His wide eyed blue wonderment shows intelligence crossed with quiet assurance. 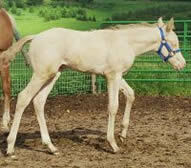 Long legs exhibit sturdy Quarter Horse bone balanced with graceful Arabian movement. 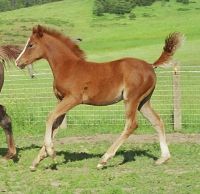 Whether as a breeding stallion for Arabian mares or a powerful performance gelding, this colt will create lightning where ever he goes! “ Crème” arrived two weeks early and was born in the middle of the herd. Every mare out there was fighting over her and well they should. When she blinks those baby blues at you she is irresistible! 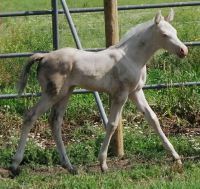 This filly is a blue-eyed cremello with an unusually large percentage of Arabian blood in her background. With a dished head the envy of many a full blood Arabian, long legs, short back and strong hip she is definitely the cream of the crop! And when she runs she literally floats over the top of the grass. Our new “Little Buck” is a very well balanced baby both physically and genetically. His typy Arab head is complemented with a nice neck, shoulder, short back and good hip. 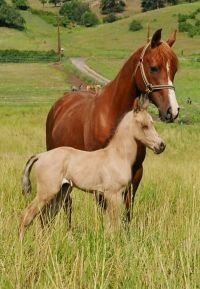 His sire’s strong Quarter Horse bone gives him a sturdy body and from his dam comes type and fluid movement. And can this baby run! 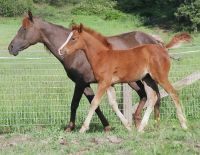 Genetically crossing the line bred Skipper W Quarter Horse bloodlines with Arabian linebred Bask/Raffles produced substance and bone with Arabian style type and beauty. 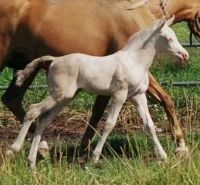 “Little Buck” was bred to work and will be ideally suited for a performance career in reining, cutting, endurance, Sport Horse or the prettiest trail horse on any ride. 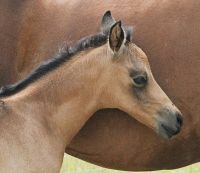 Our new “Pretty Pal Filly” was a pasture surprise coming a week and a half earlier than expected! But what a delightful surprise! “Pretty Pal” has a dished head that makes Arabian admirers jump with joy. 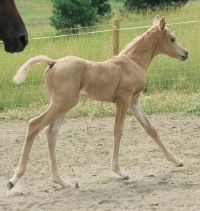 Couple that with a nicely conformed body and dynamite palomino coloring and this filly is a winner! Genetically she comes by winning naturally as her Arabian dam is a racehorse. Her grand dam is Arabian race mare Fulfilled Dream, considered one of the top race broodmares in the US. “Pretty Filly” is an understatement as this baby is going to be gorgeous and performance packed on top of it! 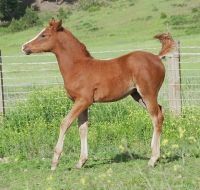 “ Irish” is a performance packed bright chestnut colt born on St. Patrick’s day. He is superbly suited both physically and genetically, to become a champion race horse, a substantial endurance competitor, a dynamite cutter/reiner or a superb Sport Horse. 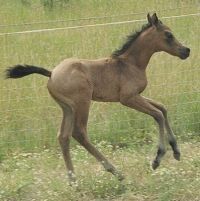 If you are looking for an athletic individual with great old Arabian bloodlines, than look no further.